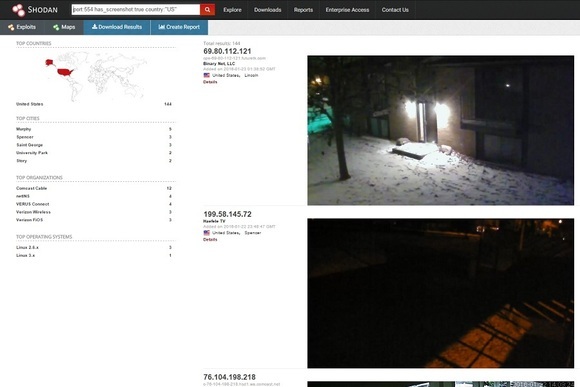 Security camera snooping made easy, thanks to the Shodan search engine. A new dedicated filter for vulnerable camera feeds exposes the need for better home IoT security. In case you needed a reminder to secure your IP security cameras with a strong password, a new feature of the Shodan IoT search engine should do the trick. By typing “has_screenshot: true port 554” while logged into the search engine, users can now see screenshots from vulnerable webcams around the world. Ars Technica reports that the new search filter was first spotted by security researcher Dan Tentler, who often tweets links to cameras and other insecure IoT devices surfaced by Shodan. Shodan itself has been around since late 2009, indexing details on all kinds of Internet-connected devices that are beyond the purview of a traditional search engine such as Google. It’s pitched mainly as a security research tool and a way for businesses to monitor connected device usage, but it has also exposed controls to utilities, heating and cooling units, and traffic systems. We reported on the vulnerabilities it can expose back in 2014. Why this matters: Shodan’s new webcam-snooping feature raises more questions about who is responsible for keeping IoT devices secure. Some of the blame lies with consumers, who are often overconfident about the security of their connected devices. But as Ars points out, vendors aren’t doing much to help with that problem, as they race to the bottom on price, neglect security, and gloss over the risks of using their products. If nothing changes, we may see government regulators clamp down on insecure devices; maybe they’ll be able to use Shodan as an enforcement tool. Being an Nix admin over 5+ years, I always be responsible for the security management of Linux servers. 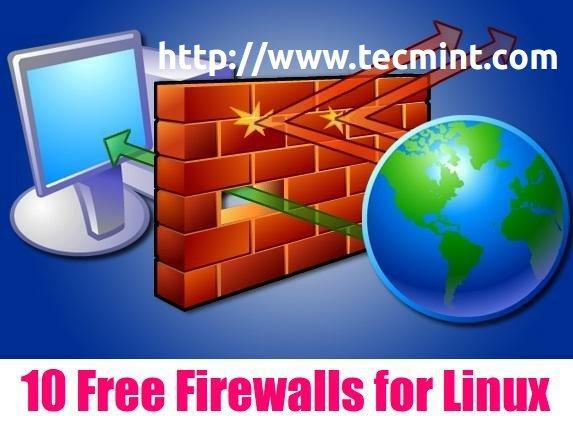 Firewalls plays an important role in securing Linux systems/networks. It acts like an security guard between internal and external network by controlling and managing incoming and outgoing network traffic based on set of rules. These set of firewall rules only allows legitimate connections and blocks those which are not defined. There are dozens of open source firewall application available for download in the market. Here in this article, we’ve come up with 10 most popular open source firewalls that might be very useful in selecting one that suits your requirements. Iptables/Netfilter is the most popular command line based firewall. It is the first line of defence of a Linux server security. Many system administrators use it for fine-tuning of their servers. It filters the packets in the network stack within the kernel itself. You can find a more detailed overview of Iptables here. It lists the contents of the packet filter ruleset. It’s lightning fast because it inspects only the packet headers. You can Add/Remove/Modify rules according to your needs in the packet filter rulesets. Listing/zeroing per-rule counters of the packet filter rulesets. Supports Backup and restoration with files. IPCop is an Open Source Linux firewall distribution, IPCop team is continuously working to provide a stable, more secure, user friendly and highly configurable Firewall management system to their users. IPCop provides a well designed web interface to manage the firewall. It’s very useful and good for Small businesses and Local PCs. You can configure an Old PC as a secure VPN to provide a secure environment over the internet. It’s also keeps some frequently used information to provide better web browsing experience to its users. Its Color coded Web Interface allows you to Monitor the performance Graphics for CPU, Memory and Disk as well as Network throughput. It views and auto rotate logs. Provides very secure stable and easily implementable upgrade and add on patches. Shorewall or Shoreline Firewall is another very popular Open source firewall specialized for GNU/Linux. It is build upon the Netfilter system built into the Linux kernel that also supports IPV6. Uses Netfilter’s connection tracking facilities for stateful packet filtering. Supports a wide range of routers/firewall/gateway applications. A GUI interface with Webmin control Panel. Supports Masquerading and port forwarding. UFW is the default firewall tool for Ubuntu servers, it is basically designed to lesser the complexity of the iptables firewall and makes it more user friendly. A Graphical user interface of ufw, GUFW is also available for Ubuntu and Debian users. Add/Remove/Modify Rules according to your needs. Vuurmuur is another powerful Linux firewall manager built or manage iptables rules for your server or network. At the same time its very user friendly to administrate, no prior iptables working knowledge required to use Vuurmuur. Can be easily configured with NAT. pfSense is another Open Source and a very reliable firewall for FreeBSD servers. Its based on the concept of Stateful Packet filtering. It offers wide ranges of feature which is normally available on expensive commercial firewalls only. Highly configurable and upgraded from its Web – based interface. Can be deployed as a perimeter firewall, router, DHCP & DNS server. Configured as wireless access point and a VPN endpoint. Traffic shaping and Real Time information about the server. Inbound and Outbound load balancing. IPFire is another open source Linux based firewalls for Small Office , Home Office (SOHO) environments. Its designed with modularity and highly flexibility. IPfire community also took care of Security and developed it as a Stateful Packet Inspection(SPI) firewall. Can be deployed as a firewall, a proxy server or a VPN gateway. Support hypervisors like KVM, VmWare and Xen for Virtualization environment. SmoothWall is an Open Source Linux firewall with a highly configurable Web based interface. Its Web based interface is know as WAM (Web Access manager). A freely distributable version of SmoothWall is know as SmoothWall Express. Supports LAN, DMZ, and Wireless networks, plus External. Backup and restoration facility like. Endian firewall is another Stateful packet Inspection concept based firewall which can be deployed as routers, proxy and Gateway VPN with OpenVPN. Its originally developed from IPCop firewall which is also a fork of Smoothwall. Can secure web server with HTTP &FTP proxies, antivirus and URL blacklist. Can secure Mail servers with SMTP and POP3 proxies, Spam Auto-learning, Greylisting. Last, But not the last Configserver security & firewall. It’s a cross platform and a very versatile Firewall, it’s also based on the concept of Stateful packet inspection (SPI) Firewall. It supports almost all Virtualization environments like Virtuozzo, OpenVZ, VMware, XEN, KVM and Virtualbox. Its daemon process LFD( Login failure daemon) checks for login failures of sensitive servers like ssh, SMTP, Exim, Imap,Pure & ProFTP, vsftpd, Suhosin and mod_security failures. Can configure email alerts to notify if something goes unusual or detect any kind of intrusion on your server. Can be easily integrated popular web hosting control panels like cPanel, DirectAdmin and Webmin. Notifies excessive resource user and suspicious process via email alerts. Can protect your linux box with the attacks like Syn flood and ping of death. CSF Homepage CSF Installation Other than these Firewalls there are many other firewalls like Sphirewall, Checkpoint, ClearOS, Monowall available in the web to secure your Linux box. Please let the world know which is your favourite firewall for your Nix box and leave your valuable suggestions and queries below in the comment box. I’ll come with another interesting article soon, till then stay healthy and connected with Tecmint.com. 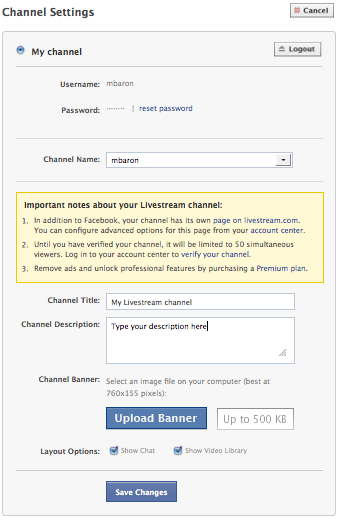 How to Create LiveStream Video for your Facebook FansPage. 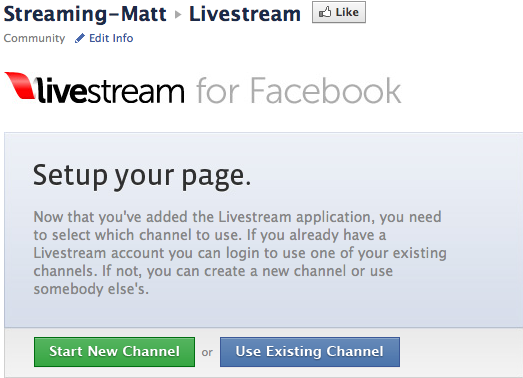 Livestream for Facebook allows you to add an existing Livestream Channel to a Facebook fan page. By utilizing the app users are also able to share their live stream and on-demand library. The application is available to both free and premium users. There are two easy places to open the Livestream for Facebook install process. They are as follows, either navigate to your account center on Livestream.com and click get started on the following image. Click the “Get Started” button on the Livestream for Facebook Homepage to begin, you’ll then need to log into the Facebook account associated with your fan page. 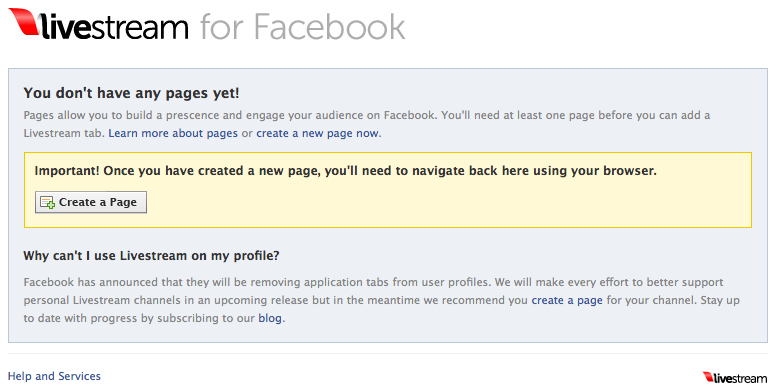 If you do not have a fan page associated with the account you logged into you’ll be prompted to create one. 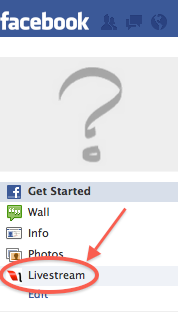 Either create a new fan page from here or log into another Facebook account that is associated with your fan page. Once created/logged in you’ll see the screen below, with your fan page list. Once you’ve arrived at the Livestream Tab Manager, select a Facebook Page to begin configuring by pressing the “Add Page Tab” button. You’ll then see the actual prompt to install on your fan page, confirm the addition and click the Livestream tab on your Page. After this Livestream for Facebook will be on your page and setup is almost complete. Once you’re on your fan page you’ll see the Livestream logo on the top left-hand corner. Choosing the channel: Once you click on the app you’ll need to sign into your Livestream channel or create a new one. Select “Start New Channel” button to create your own channel. Create a Livestream username, password, channel name, and enter your email address. Click the “Signup” button to confirm the details above or simply use an existing channel. From the settings page users can choose the channel, the title and description as well as the ability to add a banner graphic. There are also layout options to enable or disable the Video on-demand library and Facebook chat. From this page you can also choose another Livestream channel, by choosing other channel instead of my channel. 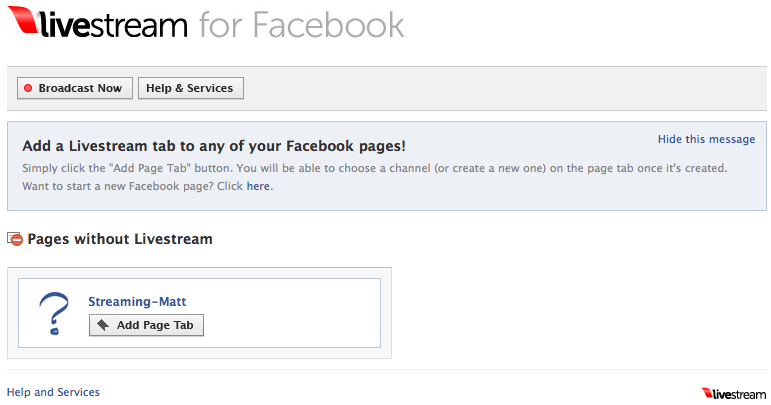 You have now succesfully configured Livestream for Facebook. 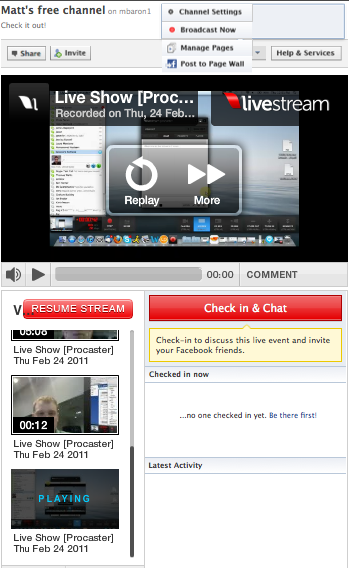 From here viewers can watch your live stream, your VOD content and also check in & chat. Check in & chat allows users to chat via Facebook and will also post on their wall stating they’re watching your broadcast. Users can also share a link to the channel via Facebook, Twitter, embed and email from the app. Please be advised, at this time any user that has their Facebook account configured for secure browsing (https) will need to switch to standard viewing to use the Livestream for Facebook. Make Livestream the default Facebook page tab: When you’re logged into the account that owns the page, go to the page, click on “manage permissions” (in the upper left) and “default landing tab” allows you to change the tab based on a drop down. Livestream can develop custom Facebook live streaming applications to suit your needs, including pay-per-view, donation, ‘like-to-watch’, live-blogging, multi-channel and much more (see an example application made for the Facebook f8 conference). Email services@livestream.com for information and pricing. Bagaimana Jaringan 5G Berkerja ? gaimana Jaringan 5G Berkerja ? – Meskipun standar untuk 5G belum ditetapkan, dan jaringan komersial diharapkan pada tahun 2020, Ericsson sudah menunjukkan fungsionalitas inti untuk 5G, yang akan sangat penting untuk memungkinkan adopsi teknologi dari perspektif konsumen dan komunikasi antara perangkat (mesin-jenis Komunikasi – MTC). Multipoint koneksi dalam jaringan 5G. Dual-LTE connectivity 5G: perangkat 5G dapat bervariasi antara daerah yang ditutupi dengan jaringan akses radio LTE dan 5G, dengan yang dapat membangun hubungan paralel dan lancar dapat melewati koneksi antara dua jenis jaringan. Dukungan untuk konektivitas ganda 5G-LTE akan memungkinkan jaringan 5G menawarkan dukungan beberapa standar dan band frekuensi di perusahaan dan di jaringan radio. Jaringan Multipoint perangkat 5G Handphone menghubungkan ke dua BTS jaringan 5G secara bersamaan, yang akan meningkatkan kecepatan transmisi dan throughput jaringan melalui beberapa aliran data, serta meningkatkan daya tahan terhadap sinyal lemah atau variasinya. Jaringan multipoint 5G akan sangat penting untuk mendukung jaringan multi-layer yang mengandung cakupan secara makro. Teknologi 5G akan berdampak pada jaringan selular seluruh dan ekosistem terkait perangkat melalui akses radio, IP inti dan menggunakan awan. Dari perspektif akses radio 5G merupakan evolusi dari teknologi saat ini, dan jaringan LTE, dan teknologi akses radio baru, pada frekuensi yang lebih tinggi. Tutup kerjasama antara band frekuensi yang berbeda, standar teknologi dan lapisan jaringan akan sangat penting untuk memastikan koneksi yang lancar miliar perangkat yang terhubung, mesin dan “hal-hal” yang akan mendukung pelanggan, komersial dan aplikasi industri. Uji peralatan perusahaan Ericsson, mengandung 5G perangkat dan stasiun pangkalan jaringan radio 5G beroperasi pada pita frekuensi 15 GHz, serta demonstrasi teknologi yang tersedia di stan Ericsson di Mobile World Congress di Hall 2, Stand 2N60. BloggerSmart.net – 9 Tips Browsing versi Blogger Smart, penggunaan metode browshing sangat mempengaruhi bagaimana hasil yang kita inginkan dapat ditemukan secara cepat dan sesuai. Terkadang ketika kita sedang berselancar di dunia maya, kita lupa dengan apa yang akan kita cari atau justru bingung mau mencari apa. Oleh karena itu admin akan mencoba berbagi beberapa tips dari pengalaman saat browsing. 1. Menggunakan English Keywords untuk mencari problem solved. How to install .. and others..
Fasilitas Advanced Search Google saat ini masih jarang digunakan, padahal kalau dilihat dari manfaatnya lumayan membantu kita untuk men-custom pencarian yang kita inginkan. Mulai dari wilayah, waktu, bahasa, domain, format, dan lain-lain. Sambungan dari tips yang pertama, sudah sewajarnya orang yang terjun di dunia IT sedikit demi sedikit faham dengan bahasa Inggris, meskipun tidak lincah (english pasif), karena bahasa inggris sangat dibutuhkan. Contoh yang sederhana adalah fasilitas apapun yang tersedia di Operating Sistem yang anda gunakan menggunakan bahasa inggris, meskipun ada yang menggunakan bahasa Indonesia namun itu jarang ada. Oleh karena itu, fasilitas Google Translate juga sangat dibutuhkan. Contohnya ketika anda sedang browshing di salah satu website yang menggunakan bahasa inggris, namun disitu anda tidak tahu apa yang mereka bicarakan. Nah Google Translate menjadi salah satu tools yang bisa di andalkan (meskipun tidak 100% benar artinya) namun setidaknya kita mengerti apa yang dimaksudkan. Fasilitas Bookmark adalah salah satu fasilitas yang sangat penting untuk digunakan. Dengan fasilitas Bookmark ini kita dapat menyimpan link dari salah satu website yang kita simpan untuk nanti kita visit lagi, gunanya ketika kita close dari browser, karena ada kalanya manusia mengalami lupa. Salah satu senjata lainnya yang sering admin gunakan untuk menyimpan sebuah laman website (misal tutorial) dalam format pdf, sangat cocok sebagai tips sederhana untuk menyimpan tutorial dengan teknik offline. Browser Incognito ini digunakan ketika anda tidak ingin ada history dari browser yang anda gunakan. Atau juga bisa digunakan ketika anda sedang editing website, dan kita bisa testing’nya dengan menggunakan browser anonymous. Karena disitu sama saja dirinya akan meload web anda dari awal (tidak ada cache). Fitur dari HTTrack sangat membantu anda nantinya pada saat anda ingin menyimpan seluruh isi content secara offline dari website yang anda pilih. Atau bisa dijadikan backup sementara dari yang berhubungan dengan content, dll. Hasil dari download’an HTTrack sendiri berbentuk file static, jadi jangan kawatir tidak support karena tidak ada php, java, python, atau bahasa pemrograman lainnya. Dan sudah pasti support dengan browser anda ketika dibuka download’an dengan browser. Teknik Tree yang kami maksudkan disini adalah teknik untuk mencari sebuah website yang berkaitan dengan website yang saat ini anda temukan. Misalnya, saat ini anda sedang mengunjungi BloggerSmart.net, dan didalam beberapa postingan tersebut ada link, reference untuk menuju link lain. Ini bisa dijadikan teknik Tree untuk mencari sesuatu yang menarik yang bisa diambil dari beberapa web refference tersebut. Hal ini disesuaikan dengan kebutuhan anda, jika misal anda saat ini berfocus pada web technology, maka ada baiknya untuk me-Like atau Follow dari account yang cakupannya sudah besar, misalkan seperti bbc, cnn, maupun yang lainnya. Tujuannya tentu untuk update informasi terbaru. BloggerSmart.net – Tersambar petir, Google kehilangan data. Google menyatakan sebagian data mereka terhapus dari tempat penyimpangan di pusat data mereka di Belgia sesudah terkena pengaruh sambaran petir sebanyak empat kali. Sambaran itu menyebabkan hilangnya data secara permanen di tempat penyimpanan Google Compute Engine (GCE). Beberapa keping penyimpanan berhasil diperbaiki, tetapi sebagian perangkat keras yang lebih rentan terhadap padamnya listrik mengalami kehilangan data yang tak bisa dipulihkan. Dalam pertanyaannya, Google mengatakan hanya 0,000001% dari kepingan penyimpanan data mereka yang terpengaruh. “Sekalipun sistem pendukung segera mengembalikan aliran listrik, dan sistem penyimpanan dirancang dengan baterai cadangan, beberapa data yang baru tercatat di lokasi penyimpanan yang rentan terhadap padamnya listrik mengalami kerusakan,” kata pertanyaan itu. GCE membuat pelanggan Google untuk menyimpan data dan menjalankan komputer virtual lewat fasilitas komputasi awan (cloud). Tak diketahui pelanggan mana yang terkena dampak dan data seperti apa yang hilang. Google menyatakan akan terus meningkatkan perangkat keras mereka untuk memperbaiki daya tahan data dan prosedur respons untuk menghadapi peristiwa sejenis di masa depan. Sekalipun sambaran petir sebanyak empat kali kecil kemungkinan terjadi, para ahli mengatakan biasanya petir tidak perlu menghantam bangunan lebih dari satu kali di satu lokasi yang sama untuk menghasilkan kerusakan seperti itu. BloggerSmart.net – Review Aplikasi Online Spin Rewriter Berbahasa Indonesia – RewriterTools.com, merupakan salah satu aplikasi online spin rewriter berbahasa indonesia yang digunakan untuk menulis ulang (kembali) sebuah artikel guna menciptakan rangkaian kata yang unik dan berbeda dari aslinya. Meskipun banyak aplikasi spin rewriter lainnya seperti halnya spinbot.com, namun aplikasi ini mengacu pada 1 bahasa saja yaitu bahasa Indonesia. Aplikasi Aplikasi Online Spin Rewriter ini di buat dengan menggunakan framework Django, yang merupakan salah satu framework yang ada di Python, selain flask dan yang lainnya. Artikel awal atau artikel yang masih original, sebelum nanti akan diproses oleh aplikasi dan akhirnya menghasilkan artikel yang berbeda dari aslinya, tergantung dari kata atau kalimat yang akan diganti oleh aplikasi. Aplikasi memproses artikel yang masuk untuk dianalisa dan dicocokkan oleh program, apabila ada kesamaan kata/kalimat yang dimiliki database, maka program akan menggantinya dengan kata/kalimat lain sesuai dengan yang ada didatabase pengganti. Result ending dari artikel spinner yang dihasilkan oleh aplikasi sebagai output yang telah siap untuk digunakan. Menghasilkan rangkaian kata yang unik dan berbeda dari aslinya. Disamping itu aplikasi online spin rewriter berbahasa indonesia ini juga memiliki kelebihan dan kekurangan. Dapat mengganti kata/kalimat yang dimasukkan oleh user/pengguna yang sesuai dengan database record dan kemudian diganti dengan database pengganti. Dapat diakses oleh siapa saja, karena sifatnya publik. Berbahasa Indonesia, sesuai dengan fokus yang diambilnya yaitu Spin Rewriter berbahasa Indonesia. Mudah penggunaan dan gratis diakses oleh siapa saja. User/pengguna tidak dipungut biaya sepeserpun. Database yang masih sangat terbatas, mengingat masih versi beta. sesuai yang ditampilkan pada link All Database yang menampilkan seluruh database yang tersedia di aplikasi tersebut. Namun dengan demikian, kedepan database tersebut akan di upgrade secara bertahap. Mengacu pada 1 database pengganti saja, hal ini masih dalam proses pengembangan untuk dapat mensupport dibeberapa database pengganti. fix, support 1 or 2+ database replacements. Sesekali terjadi kejanggalan kata, hal ini disebabkan karena ada duplicat kata dalam database. oleh karena itu, pihaknya juga sangat mengharapkan adanya laporan apabila terjadi kejanggalan kata/kalimat dari yang dihasilkan aplikasi tersebut melalui Report bug & Request Database. Pengguna atau masyarakat yang menggunakan aplikasi online spin rewriter ini dianggap telah membaca dan menyetujui Disclaimer yang ada di rewritertools.com. Layanan aplikasi online spin rewriter ini tidak disarankan digunakan sebagai tools menulis arti al-Qur’an, al-Hadit’s atau berita ulang. Dikhawatirkan akan berbeda dengan arti, maksud dan tujuan awal. Setelah menggunakan aplikasi online spin rewriter ini, kami sangat menyarankan kepada pihak pengguna untuk meninjau ulang dari artikel yang dihasilkan. Nah, begitulah tadi sedikit review dari aplikasi online spin rewriter yang ada di rewritertools.com. Untuk informasi lebih lengkapnya bisa langsung dikunjungi websitenya di rewritertools.com. Di Operating System Linux pada dasarnya sama penggunaanya hanya saja ada beberapa repository dan fitur yang berbeda, dan itupun hanya sedikit sekali perbedaanya. Contohnya jika di Debian lebih ke jaringan, di Kali Linux lebih ke hacking, dan Ubuntu lebih ke desktop familiar. Oleh karena saya juga sering menyebutnya semua Linux sebenarnya sama saja. Tidak semua modem langsung disediakan aplikasi khusus untuk support dengan Linux, berbeda dengan di Windows. Oleh karena pengguna OS Linux biasanya harus mencari cara bagaimana untuk settingnya. Oleh karena itu, semoga dengan adanya sedikit tutorial kali ini dapat membantu teman-teman yang sampai saat ini masih gelisah dan belum menemukan solusi untuk setting modem. Type modem yang digunakan dapat mensupport os linux. Wvdial dapat mensupport type modem yang akan digunakan. Namun saat ini wvdial sudah sampai update versi terbarunya, yang memungkinkan wvdial dapat membaca di banyak tipe modem yang berbeda, contohnya seperti Huawei, Smart, Telkomsel Flash, Axis, Vodafone, Prolink dan lain-lain. 1. Pastikan sudah dipersiapkan Modemnya dan Card Sim-nya. 2. Download wvdial terlebih dahulu, langkah ini agan bisa meminjam komputer / laptop teman. hehe.. Untuk mendownloadnya silahkan download dibawah ini yang versi .deb. 4. Tancapkan modem, dan Check apakah USB Modem sudah ada. idVendor           0x12d1 Huawei Technologies Co., Ltd.
Nah disitu terlihat idVendor dan idProduct nya. Nah kebetulan disini sudah kami buatkan Script Python-nya untuk mempermudah penerapannya, jadi settingnya tidak kemana-mana, cukup di satu file python ini saja. idProduct, juga di isi dengan idProduct yang kita cari tadi. [Dialer indosat], indosat diganti dengan sesuai keinginan. Baud, disesuaikan dengan Baud Rate pada modem agan. Phone, disesuaikan dengan dialler phone pada providernya. os.system("wvdial indosat"), bagian indosat diganti sama seperti pada indosat yang diganti diatas [Dialer indosat]. print "[-] Please Access as root..!" print "Pilihan Setting: n 1. Connectn 2. Setting"
8. Eksekusi dengan python (Tenang Python2.7 sudah ada permanen di hampir seluruh distro Linux). Pastikan akses sebagai Root. Pilih pada nomor ke-2 dahulu untuk mensettingnya secara otomatis pada /etc/wvdial.conf. Langkah tersebut hanya 1x dilakukan, dan selanjutnya kita hanya perlu pilih pada nomor 1 saja setiap akan terkonseksi. Mudah bukan? Contoh hasil tampilannya seperti ini. Nah sekian dulu sekiranya pembahasan kali ini, semoga dengan adanya artikel ini dapat membantu temen-temen semuanya.